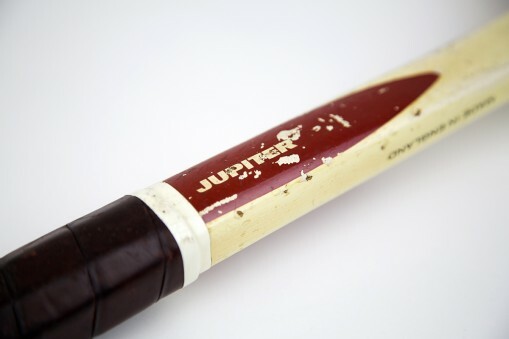 The Slazenger Jupiter – an object in transition, is a glorious new guest blog post by Neil Armstrong. The Museum is very proud to host this post along with all the fabulous images provided by Neil. In answer to your question Neil – there aren’t too many photos AND I would have happily uploaded more! Thank you so much for this hugely satisfying read around the life of an object within the life of a man – so much to mull over and enjoy. I’m off for a re-read! 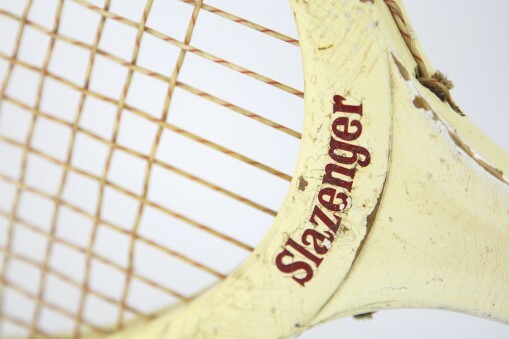 The Slazenger Jupiter was my first ‘proper’ tennis racket. Nylon fibre strung, it would take me another two barter- exchanges before I got my hands on a more expensive, catgut powered, upgrade. In these early years the Jupiter was to loom large in my world; a Thunderbirds generation space child. Tennis racket as monolith in orbit around the ringed planet. I acquired mine in the same year Kubrick’s 2001 was released. Smash, dash, forehand volley; the future was now – and all this well before Star Wars hit the screen. This one is mostly painted wood, giving it a functional, minimalist appeal. Ultimately I had my sights set on the visually richer, woody looking Dunlop Maxply – the choice of champions – a real piece of furniture. But this lesser model was my starting point, encompassing all the aspirations that subsequent purchases promised to deliver on. There is something special about the first of anything you own or do, but it’s often the case that these things get lost, destroyed or discarded long before their status becomes apparent. After all, you aren’t necessarily aware of the significance of functional objects in the present. It takes time and the attachment of a personal history to establish that. So it’s not just a tennis racket. It represents much more, and when I put it into timeline context it’s a signifier of how my overall attitude to life has evolved. It is also an object itself in transition. It sheds its skin a little later. Why the Slazenger Jupiter? Obviously it had a cool name, but it was in fact second hand. It certainly wouldn’t have been worth my parents paying full price for a new one if it turned out that I didn’t take to the game. I had friends who had already moved on to classier models so this re-cycling was a low risk bargain purchase at the time. 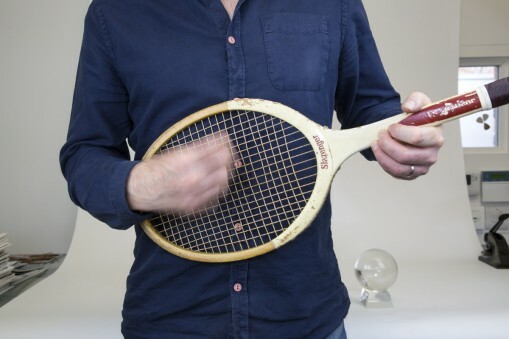 The boy who first introduced me to his private tennis club had one of these rackets but managed to snap it at the neck. His resourceful dad made two metal plates to bolt the thing together again and he proudly brandished the resultant lethal weapon with scant concern for the fact that the racket was now totally unbalanced and potentially quite dangerous. My friend wasn’t talented or tenacious enough to develop a compensatory technique and I don’t remember him ever progressing to another model. If you want to check out the inner landscape of a person’s character you should put them on the other side of a tennis court. Any competitive game will do, but tennis is particularly adept at testing someone’s resolve. It’s something to do with the points system. You are never far away from disaster. There is always a chance that the player ahead on points will lose their nerve at the crucial moment and reveal a psychological flaw that lets their opponent in. Then there is the question of honesty, nay, integrity – “did you really call that out… I mean REALLY? ?” People reveal their interior selves on a tennis court. As I got good at the game I found I was the only one at my school who could beat the teachers at anything (tennis wasn’t taught so not many pupils knew how to play… and for that matter not many teachers did either). I worked out that I don’t like to lose. How one deals with that is fundamental to most things. However You will lose, so you need to deal with that too. I worked out there are countless strategies to be employed once you understand the game is more than the sum of its parts. Know your own strengths. Assess your opponent, then adapt your strategy to exploit their flaws. All very erm… aggressive. Like something out of a hard sell handbook. And then there is the pursuit of status. Status in a world where to win at something so visible to the rest of the school took you well beyond the constraints of academic success. Opportunities present themselves in the social pecking order. I suspect this played a considerable part in forming the full grown man. I, like many others no doubt , saw the racket itself as an object of desire. It is something akin to a sword. Both beautiful as a ‘thing’ in your hand to be swept through the air and brandished, and supremely satisfying when, on hitting the sweet spot, you become a master of destiny and leave your opponent (only metaphorically hopefully) decapitated. On a good day this feeling can be experienced over and over again. It’s a bit of a drug… oh and also the basis of capitalism. Over time this object evolved. Lots of us have stood in front of the mirror with a racket and laid it down with some heavy duty riffing or arm flailing kerranging. Mine was ‘Born to be wild’ and ‘Sunshine of your love’ with a bit of Dylanesque strumming thrown in. 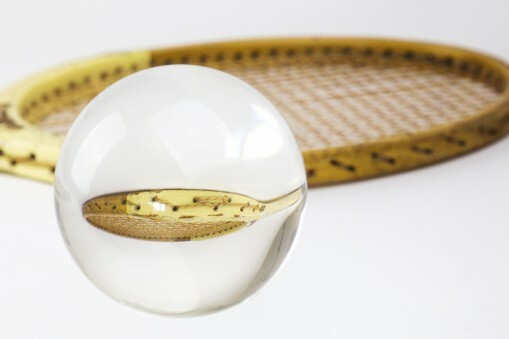 The tennis racket transitioning into a new object of aspiration and promise. The guitar becoming the mime made real. Fortunately I still have my first guitar, well my first proper acoustic guitar. One that I acquired from a shop brand new, duly purchased in 52 weekly instalments. I played it regularly for years despite an exotic selection of wonderfully shaped electric monstrosities also passing through my hands. These, in turn, were inevitably traded for yet more second hand discoveries on the road to nowhere. It was at about this point that my tennis playing ambition waned and my guitar playing ambition grew. 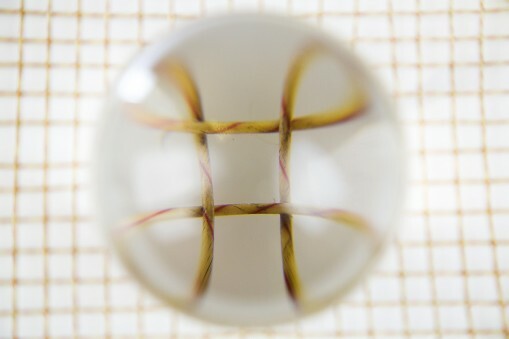 Objects in metamorphosis. I played tennis with my (natural) left hand – but something told me that this guitar idea was a keeper and that it would be sensible to learn right handed so you could pick up other guitars more readily. I am still in awe of my foresight at this juncture. The guitar went with me to art college. The guitar has taken me to lots of places that I would never have otherwise been, and given me a glimpse of a whole other world. I’m thinking it fulfilled some of what I imagined a tennis racket might. But, in reality, making art has taken me to many more places than both of them. Part of me thought to make art like I played tennis…to win. Except there is the rub. You can’t win at art. In fact you pretty much always fail; there is always a better, more alluring idea just around the corner and an issue that won’t resolve. That is both annoying and stimulating. A few years after I left art college I found myself regularly playing tennis in a network which included a previous tutor of mine. Purely recreational – except it never really is once you get locked into combat. One particular game of singles stands out in my memory. I could tell he soooo wanted to beat me, and I was already down a set. This was to be his ‘moment’… and my task was to deny him that. A bit mean really. We had such a struggle and eventually I won. Strangely though the winning, once achieved, was of little consequence. I remember it was such a well fought game, and that it marked a moment of mutual respect. The battle was more important than the victory. Well to me at least. In hindsight, to be more sure of the reciprocity of that sentiment, I should really have lost I suppose. But let’s not be silly. Not long after that game the ‘big serve’ began taking its toll on my back, so I made the sensible decision to give up playing for good. To forgo my gladiatorial fix. I let it slip away surprisingly easily. It made me think about what drives ambition, and how it gets re-aligned over time. Continuing my art practice; to hopefully make something that is more substantial than just ‘me’ – and offering that to others – well that’s about the sum of my vision now. Importantly though, what sets this particular artistic ambition apart from playing a ‘game’ is that, unlike tennis, I can’t imagine giving it up. It is a process without resolution, ultimately beyond ‘winning’ or ‘recognition’, where in fact there is no actual goal at all; rather continuation. My Slazenger Jupiter may be past its best and no match for the equivalent carbon fibre powerhouses of today, but as an evocative object it has become the embodiment of an evolved understanding of competition, and a reminder to be sceptical of ambition in most, if not all, of its forms.